Comments: Weatherbug is a weather application that provides weather information on cities, worldwide. This app is simply beautiful on the iPad and includes current conditions, 7 Day forecast, Camera Views and a zoom-able weather map. iPhone version is also a good weather app. Comments: This app is for keeping golf score and statistics. I've only used it once, but it was very easy to use and provided some interesting statistics about my game. You can keep score for your 4 some, if you wish. There is a paid version of this app ($29.99), which is a GPS locator, as well. 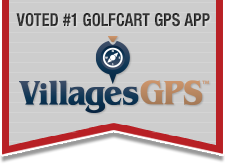 App has thousands of golf courses, including those in The Villages. The GPS on the iPhone will locate the closest courses to your current location. This is very useful, if you are in an unfamiliar area. Comments: This was one of my first apps and I believe one of the most amazing. The apps will "listen" to any music source (Radio, CD, TV, your humming, etc.) and will identify the artist and song. Once identified, you are normally presented with options to purchase from iTunes or many times, you can watch a YouTube video of the song. Pandora Radio-cost 0.00, This is a radio station that you enter any artist and the radio will play that artist and artist similar to the one you picked. AppBox Pro-cost .99 cents, this app has approx 35 different apps such as currency convertor, loan calulator, unit conversion app and many others. Photo Transfer app- 2.99 allows transfer from pc to i pad to i touch wirelessly of all photos, quick and easy. Riverside NJ, Moorestown NJ, Mt. Laurel NJ, Tuckerton NJ, Mount Laurel NJ. A few free apps that I like are: foursquare, echofan (which is twitter), free apps (which offers all kinds of apps for free), background check (just to be nosey! ), & photoshop mobile (for the pics I take with my phone!). I've had Weather Bug for my computer for years and now have it on my Droid phone. It's great to see what the heck is going on while you're out, especially around here, where weather can go from okay to SEVERE in the blink of an eye. I've also got Kindle for my computer and just added it to my phone. Nice when I have to wait around, I can read. Will have to see if I can find Shazam for my phone....sounds interesting. Last edited by pooh; 07-03-2010 at 06:23 PM. The best radar for the iPhone is iweathr.com (note the missing letter in weather) Just goto Safari and type the address in then bookmark it. we put shazam on the iphone when it came out. haven't put it on the pad yet, but just noticed a new limit. Do you need to be a union hummer? We tried humming a few bars and nuttin happened. Maybe we should hum AT a few bars to let looser? By the way, we dodn't get 3G on the pad because one of us that pays bills and has too much to do says we have too many monthlies - I can lose the data plan in the iPhone or not get the pad data. If you got time during the day on your I-Phone. Check out Farm Story. You can manage your own farm, Plant crops, have cattle and things. You can visist other farms and water them for people. My kids have it, and got us hooked on it. DirecTv also has an app for Iphone along with NetFlix. I use WFTV.com mobile set up for weather. animated radar is great. We had Weather Bug at work, and they made us remove that program due to Virus threats from the program. Remember: Improvise, Adapt and Overcome !!!! iPhone crashed Friday, Apple replaced it ,lost some apps and data. We need to get the weather channel back that had hourly, three day, current, severe alerts, and 10 day. What isnthe correct URL for that? THe Weather Channel and Weatherbug should be available in Market on your phone. The urls don't show up on my Droid. For the computer, weatherbug.com should bring it up. The Weather Channel for the computer is weather.com....again, I don't have the url for my phone. Since you quoted my post, I'll assume you were asking me. Remember I don't have an Iphone, I have a Verizon Droid Incredible. Just go to the app store and search for weatherbug or weather channel. There are lots of weather apps, so you might just want to search for weather and see what you get. What version of iPhone did you have go belly up ?